My rating: 8/10. Titanium Skagen watch. Slim 8mm timepiece. Hello, today I’m doing a Skagen SKW6007 review. 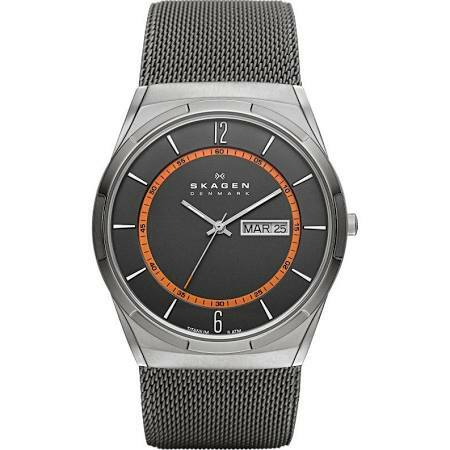 This is a popular sleek watch from Skagen’s Aktiv range, it’s made of titanium which makes it both strong and lightweight, this is in a gun metal grey colour. I hope you enjoy this Skagen SKW6007 review below. The dia lof this Skagen watch has a nice minimal feel to it. The orange circle within the dial does a good job at drawing your eye into the centre of the watch, also adding a nice touch of colour to the design. The hands also have a nice coating of lume to make them easier to read in dim lit conditions. There’s a day and date display located at the 3 o’clock position on the watch. As I mentioned earlier on, the casing is made of titanium. 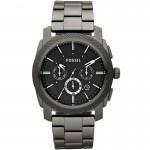 This is stronger than stainless steel and also lighter, making it a popular material for watches. A mineral crystal glass can be found protecting the dial on the front of the watch. This type of glass is specially hardened to offer a good level of scratch and knock protection. It’s commonly found on watches in this price range so overall, I’m quite happy with this. At the heart of the watch is a quartz movement. 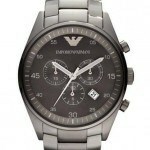 These are a popular choice in affordable watches as they are reliable and accurate as well as being fairly affordable. The casing diameter of this men’s Skagen watches measures approximately 41mm in diameter and has a thickness of just 8mm. It’s a slim watch with a nice large dial, a popular combination these days. The strap is made of stainless steel in a mesh style which is something I’m quite a fan of lately. From trying various mesh style straps I find them to be quite comfortable and extra easy to adjust the size of. It’s a nice wide strap measuring 28mm in width. Band: Stainless steel mesh strap, standard length, 28mm width, jewellery style clasp. Case: Titanium casing, sizing diameter: 41mm and thickness: 8mm. 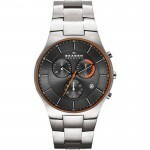 Skagen makes a nice selection of relativly affordable slim watches with popular dial designs. This is a strong and lightweight model that features a popular mesh style strap.Overall, I’m quite pleased with the design of the watch, I like the touch of colour they’ve gone for with the dial and am happy to see the 50m water resistance rating. Hope you enjoyed this Skagen SKW6007 review. Find more watch reviews below.